My dream luggages have finally 'materialised' in the world! 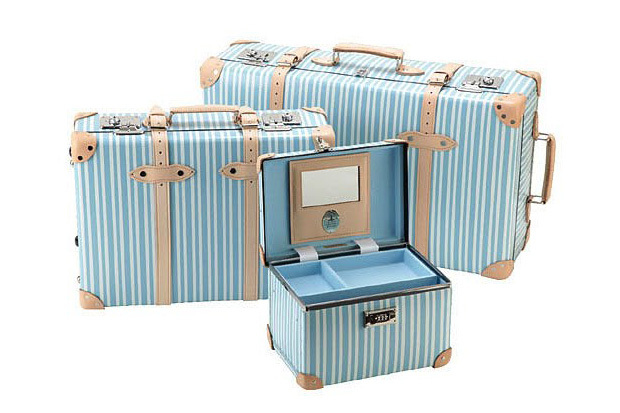 Globetrotter, the luxury trunks and luggage maker has launched a special collection, named 'Azure' this July to set the tone for refined travelling. Cruise stripes in refreshing aqua blue and white are matched with natural leather for a soft breezy colour way. The natural leather will patina over time and add a new layer of charm to these lovely travel companions. Using these luggages, I would imagine vacations in the south of France, elegant holidays such as those in the 19th century, where each journey made are full of novelty and adventure.